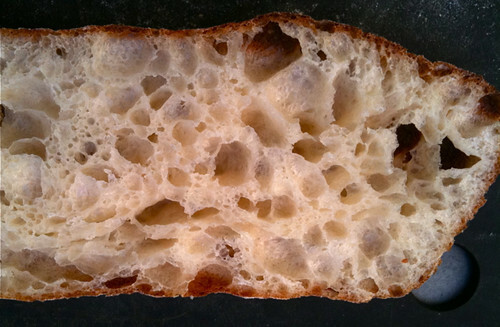 Here's the receipe for ciabatta, which I negleted in the previous post. In part, I did this because the recipe is usually the least important part in baking and there are many recipes for ciabatta in cookbooks and on the web. (Here's two at Wild Yeast and Breadcetera). 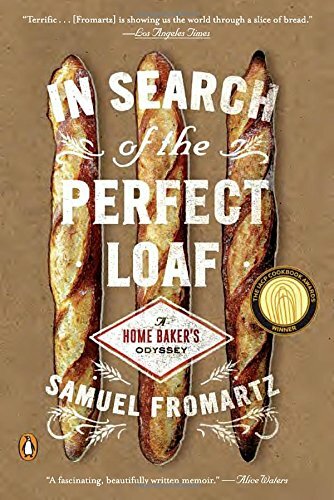 Far more important than the recipe is knowing how much to mix, how long to let the dough ferment and how to shape the loaf -- things that you learn the more you bake. But in response to requests here's my latest, which builds over two days to develop flavor. You can see this and other terrific loaves over at Yeastspotting. Quantity: two loaves, 475 grams each. Mix flour, water and yeast until combined into a stiff ball. Cover and let sit at room temperature for about 16 hours or until ball has expanded but not collapsed. 1. Mix flour and water together until combined and no longer lumpy. Let sit for 20 minutes. 2. Add biga by tearing off pieces, then add salt and yeast. Mix until combined for 1-2 minutes. Let rest for 10 minutes. Feel dough to make sure there is no undissolved salt. Mix again until dough is moderately developed -- that is, until you can stretch it but it will tear. You don't want to fully develop the dough because you will build gluten strength in folding. If you mix too much the gluten will be too tight and you won't get those big holes. 3. Place dough in a oiled container and fold at 30 and 60 minutes. By now the dough should be glistening and the gluten fairly well developed. If not, wait another 30 minutes and fold a third time. Then place the container in the refrigerator for 12-24 hours. At the end of this time there should be visible bubbles in the dough of varying size. If not, remove it on the day you're baking and let rise further on counter for 60 minutes. 4. When ready to bake, preheat oven and baking stone to 480F. Place a rimmed sheet pan at the bottom of the oven. 5. Pour the dough out onto a well-floured counter and shape into a rectangle, being careful not to deflate the dough or manipulate it too much. (The more you move the dough around, the less holes you will have). Cut the rectangle in half into two loaves. Carefully move the loaves onto a well-floured couche or board. Sprinkle with flour, cover with plastic wrap or a tea towel and let rise for 45 minutes to 1 hour. When pressed slightly, the dough should spring back slowly. 6. Place parchment paper on a cutting board or peel. Carefully pick the loaves up and invert them onto the parchment paper. (Fish spatulas are great for this, or if using a couche, roll the loaf onto parchment paper). Slide loaves into the oven. Pour 1/2 cup water onto the tray at the bottom of oven. Let bake until well-done, 22-25 minutes. Here's a video from Wild Yeast Bakery in the U.K. on shaping ciabatta, though I tend to manipulate the dough less than this baker. Still, you can see, he's careful not to deflate the dough.